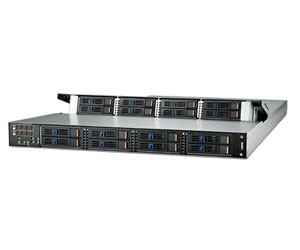 The Advantech ASR-3100 is a 1U rackmount dual Intel Xeon E5-2600 16 x NVMe SSD storage server. The product is equipped with DDR4-2133 RDIMM up to 512 GB and maximum 16 x 2.5″ hot-plug NVMe SSD, delivering uncompromised high computing performance. The high IOPS (input/output operations per second) performance of 16 NVMe SSD can achieve up to 6 million IOPS read speeds. The product is designed to fulfil needs in markets like cache/hot data, VDI (virtual desktop infrastructure), advanced data mining, OLTP/OLAP (online transaction processing/online analytical processing) for finance and e-commerce, 3D rendering, video broadcasting and massive media editing/post production. The product has U.2 (SFF-8639) designed for enterprise use, which supports 2.5″ NVMe, SAS and SATA; optimised system power, performance and cooling efficiency with a 1100 W 1+1 redundant power supply of 80 PLUS Platinum level; expandable with 2 PCIe x 8 Gen 3 and embedded M.2 SATA 6G for OS mirror; easy management with IPMI LSI Raid management, multiple system LED indicator, and front and rear I/O; and 3-5-7 service guarantee for flexible customisation, warranty and extended longevity. 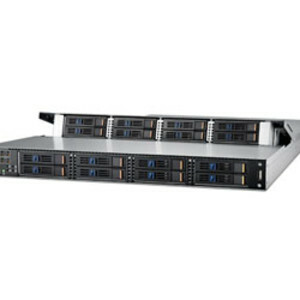 I am interested in Advantech ASR-3100 storage server .